A friend just reminded me that the Metropolitan Museum of Art in New York is also honoring Rembrandt’s 400th birthday (see my post from last Saturday) with a special show drawn from their collection: Rembrandt and His Circle: Drawings and Prints (July 11 – Oct 15, 2006). If you’re in range of New York, this is a wonderful and rare opportunity to see 44 drawings and etchings by the master and 14 more by his students and apprentices. It’s rare because drawings are so fragile that they can’t be on permanent exhibition, exposure to light damages them. I don’t mean to give the impression that they’ll dissolve into smoke on being exposed to light, like the Wicked Witch of the West’s Beautiful Wickedness melting under Dorothy’s bucket of water, it’s just a matter of light damage accrued over time. In essence you can think of a given drawing of having a “half life” of exposure to light over time. Curators must calculate the value of exhibiting drawings against the longevity of the works. (What good is it to preserve them if no one gets to see them?) You’ll also notice that drawings are often exhibited in rooms with reduced lighting levels. I also neglected to mention that there are two shows at the Morgan Library and Museum in New York: From Rembrandt to van Gogh: Dutch Drawings from the Morgan and Celebrating Rembrandt: Etchings from the Morgan (both July 15-Oct 1 2006). (As I mentioned in my previous post, there is also a major exhibit in the fall at the National Gallery in D.C.: Strokes of Genius: Rembrandt’s Prints and Drawings Nov 19, 2006 – March 18, 2007). Don’t let the “drawn from their own collection” description put you off. The Morgan and the Met have some of Rembrandt’s finest drawings in their superb collections. The Met’s collection includes Cottage among Trees (above), one of my personal favorites. There is a nice feature on the Met’s site that allows you to view this drawing in a zoomable window. Not as good as the Rijksmuseum’s posting of wonderfully large full size images, but the next best thing. You can zoom in and see details the you don’t usually see that well in book reproductions, like the wagon on the hill beside the cottage. It’s the lines themselves that are so fascinating to me, you can get lost in them close up, marveling at their fluidity, seeming casualness and amazing variety, and then pull back and realize again that they are part of the larger whole. I’ve often thought that small sections of Rembrandt’s drawings and paintings, extracted and enlarged many times, would make more interesting non-representational art than most of the intentionally non-representational art produced in the latter half of the 20th Century. I usually take a pocket magnifying glass to exhibits of old master drawings. All the more remarkable is the knowledge that drawings like this one were not meant for sale or even as gifts to patrons. 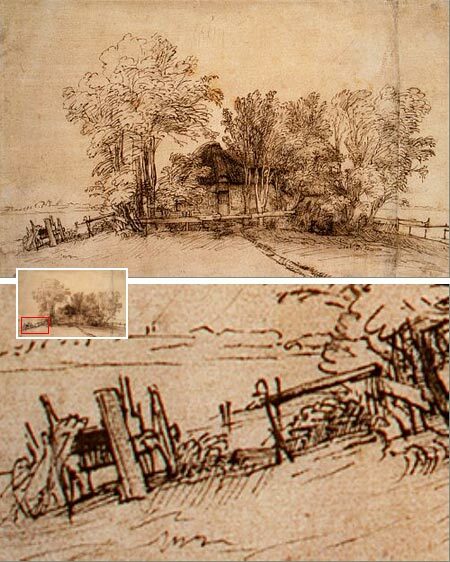 This is Rembrandt walking around the countryside and drawing for his own benefit. This is drawing at its purest and finest. 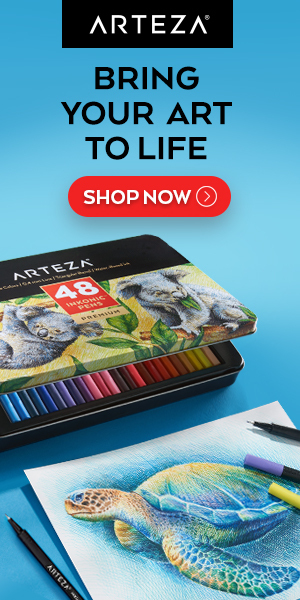 So glad to find a site by someone who appreciates the line quality in drawings. Been doing pen and ink for more than a decade now and Always am reminded that I know Nothing when I look at these masters’ works. Thank you for sharing!